Seattle Meowtropolitan is the purr-fect combination for feline fanciers: They can drink coffee and watch cats at play (or asleep), or make a reservation and visit the cats in their special room. Parker, the brawny barn cat, raised his paw in warning. After another sold-out session at Seattle Meowtropolitan, the city’s first cat café, he was petted out. Eager visitors, who had paid $10 for a drink and a 50-minute stay in the feline-filled room, had other options. They could sit kitty-corner, sipping a “meowca” or nibbling a cat-faced macaron cookie, until the resident calico came in search of a lap. They could watch the tiger tabby circle the room’s high ramps and cat bridge. Cat moods also changed as the hour passed; one midnight-black newcomer sat quietly in a corner at first, then was enticed to bat at one of the fishing-pole toys. 11 a.m.-3 p.m. and 4-9 p.m. daily except Mondays, 1225 N. 45th St., Seattle; reservations required for visiting the cat room, no reservation required for coffee shop, seattlemeowtropolitan.com. “I would totally adopt this cat,” a visitor said. That’s one of the purposes behind the new Wallingford business, the first Seattle entry in the worldwide cat-café craze. The cafes originated in Taiwan; the first U.S. version opened in 2014, with at least one other Seattle cafe, seattlekittykafe.com, in the works. Meowtropolitan co-founders and University of Washington friends Matt Lai, Andrew Hsieh and Louisa Liu were hanging out when they came across the idea online. The route to success was separating the café from the cat room. Any visitors can buy a Herkimer-sourced coffee (complete with Siamese-style latte art) and watch the cats play through the windows. Reservations are required, though — along with hand sanitizers and a zoolike two-door crossing — to enter the high-ceilinged animal room and interact with the cats. 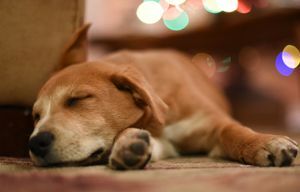 “One is permitted as a food establishment by our food program, and the other is permitted as an animal shelter by our pet program,” said Lindsay Bosslet of Public Health — Seattle & King County, in an email. When planning out the space, a pop-up event in February drew a huge response, Lai said. “We sold out 800 reservations in something like three or four days. We knew there was a demand for this idea.” The Indiegogo campaign raised about $13,000, and they made up the rest with their own funds and investors. “Rather than take the approach of putting cats in a café for humans to enjoy, we thought about building a space cats would enjoy,” Lai said. Working with Catch Design Studio and animal behaviorists, they came up with a light-filled room rife with vertical hiding spaces and climbing opportunities, offering snoozing and street-watching nooks where even the woodworking has a kitty theme. “My cat would be jealous of all this,” said Alexandra Edwards, a former veterinary technician and “feline guardian” staffing the room, monitoring cat moods and well-being. 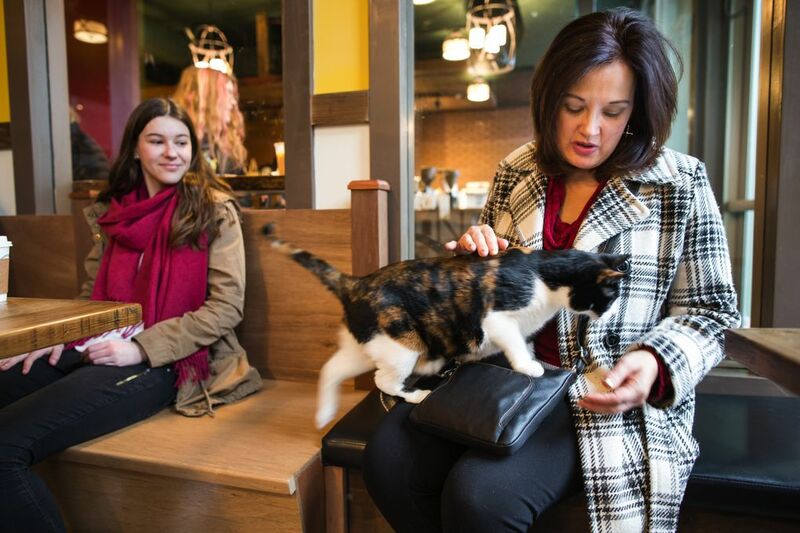 The café cats come from Regional Animal Services of King County, which judges which animals are social enough and nonterritorial enough to benefit from the placement. A few cats are expected to become resident pets, while most will soon be available for adoption. When online Meowtropolitan reservations became available last week, every opening in December sold out within days. Sixteen cats were on site on a visit Wednesday, though several remained in a separate room where animals can retreat through cat doors at will. Reservations are limited to 10 people per hour, with an hourlong afternoon shutdown. Guidelines on the entrance doors warn visitors in a number of ways not to harass the cats, to give the cats their space and to leave them alone if they want to be left alone. “If you do anything that is detrimental to the well-being of the cats, we will kick you out,” warned one disclaimer. Nearly one in 10 single women in the Greater Seattle area lives alone with at least one cat. That gives our area status of second in the country for cat ladies, behind Portland. It still leaves plenty of people who wanted the chance to pet, play with or just watch the Meowtropolitan animals, whether they couldn’t have a cat at home, no longer owned a pet or just couldn’t get enough of them. “It gives (the cats) a chance to get social interactions with people,” she said, a more positive situation to her mind than shelters, where they would spend long periods in cages. Prospective owners also get a decent sense of the cats’ true personalities in the open environment, she said; from burly Parker, who loved the attention until he got his fill, to shy Persephone, who relaxed out of sight and out of reach or silky Sheba, who companionably accepted the petting and then played with the toys hanging from cat trees. The owners are busy — and yes, they take on their share of litter-box duty — but they have no animals at home lacking for attention. Rebekah Denn, two-time winner of the James Beard Award, writes about food for several local and national publications.